Woody Guthrie sang the virtues of a working Columbia River nearly 70 years ago. Back then, a working river meant an industrialized river harnessed for power and irrigation. Today, we need to make the Columbia a working river that "rolls on" in a way that balances hydropower, barge navigation and irrigation with the amazing array of services a healthy river provides. These services include clean drinking water, healthy fisheries and recreational activities like fishing, birding, boating, hiking and camping that improve our quality of life and attract new businesses and jobs. The next several years will be pivotal for ensuring that the Columbia River and its tributaries work for farmers, fishermen, communities and the environment. This effort will be won or lost based on how we manage the following benefits that the Columbia and its tributaries provide. Water supply: Irrigated land in the Columbia Basin is vital to the health of our economy and food supply. Many communities rely on water from the Columbia and its tributaries for household uses. American Rivers advocates using water more efficiently on farms and in homes, lining and piping irrigation canals and strategically locating -- or relocating -- irrigation diversions to provide irrigation or municipal water in a manner that minimizes impacts on native fish. In addition, the renegotiation of the Columbia River Treaty with Canada may open the door to new sources of water to benefit fish, agriculture and hydropower production on the American side of the border. Native fish: Protecting and restoring the Columbia's imperiled native salmon, steelhead, lamprey and bull trout will require big changes in dam management, agricultural and domestic water use and land management, to name just a few key factors. Improving fish survival past the mainstem Columbia and Snake river dams is the most important near-term step we should take to restore healthy, sustainable fish runs. 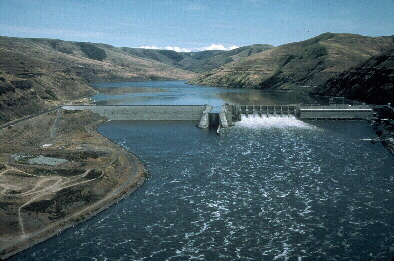 The most straightforward way to accomplish this is to maintain court-ordered spill over the Columbia River dams and restore a free-flowing lower Snake River by removing the four lower Snake River dams. In the Yakima Basin, American Rivers advocates building fish passage for salmon, steelhead and bull trout into prime habitat and improving irrigation practices to revitalize habitat in key streams. In the Deschutes Basin, American Rivers advocates for improving irrigation efficiency and permanently protecting conserved water in-stream to help ensure the success of the recent reintroduction of salmon and steelhead into the Upper Deschutes. Energy: We need to maximize our investment in energy efficiency and we need to integrate wind and other renewable energy into our energy supply. This will give the region more flexibility when it comes to reducing the impact of hydropower dams on salmon, steelhead and lamprey. It will also help wean the region off of nonrenewable, carbon-emitting energy sources like coal. Any new hydropower should come from upgrades at existing dams that are compatible with salmon recovery strategies and do not harm downstream flows. Transportation: Our largely export-oriented agricultural economy depends on affordable freight transportation to the Port of Portland and other lower Columbia River ports. Investing in improvements to the Columbia River barge system, upgrading and rebuilding Palouse-area railroads and improving the inland Northwest's highway system will allow the region to modernize its freight transportation system to better serve domestic and international markets. And it will allow grain currently shipped down the lower Snake River to move affordably via other means in the event of lower Snake dam removal. Flood control: To mitigate for changes in river flows caused by global warming, river managers should consider whether new flood control operations can keep downstream communities safe and protect or improve flows for salmon at the same time. In addition, Lower Granite Dam on the lower Snake River near Lewiston, Idaho, is filling with sediment, raising the river level and threatening to overtop Lewiston's levees. Dismantling this dam would remove the threat of catastrophic flooding, benefit salmon and allow for a restored riverfront in the Lewiston-Clarkston area. Communities throughout the Columbia Basin should invest in natural protection from flood damage by restoring floodplains and protecting existing floodplains from development. The river management issues facing the Columbia Basin are complicated and intertwined. American Rivers recognizes the many contributions of the Columbia to the Northwest's economy, culture and environment and we stand ready and willing to work with other river stakeholders to make 21st century management of the Columbia River a success story. Brett Swift is Northwest regional director of American Rivers, a national river conservation organization that has had a presence in the Pacific Northwest for almost 20 years.